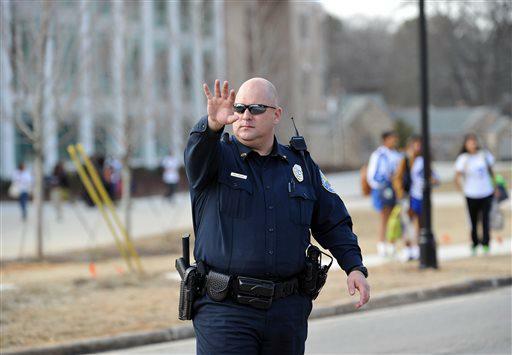 A police officer stops traffic in front of Chamblee Charter High School after a youth was arrested for carrying loaded guns, according to authorities, on Tuesday, Feb. 18, 2014, in Chamblee, Ga. The school district’s police chief, Terry Enoch, said officials have heard from parents and others in the school community about the need for mental health support. “They want more training for our educators so they can identify warning signs when kids are in trouble and have resources available to help treat issues when they arise,” he said. Similar grants will go to schools in Ben Hill, Coffee, Dade, DeKalb, Fulton, and Richmond Counties.